I read two things recently that go together like peanut butter and jelly and they make for an interesting exercise. The first is a new report, “2014 State of Marketing” from ExactTarget, one of the Marketing Cloud components of Salesforce.com. The other is The Second Machine Age: Work, Progress, and Prosperity in a Time of Brilliant Technologies, by Erik Brynjolfsson and Andrew McAfee, two economics researchers from the MIT Sloan School. 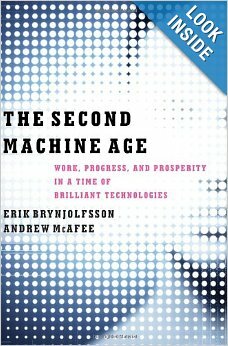 This is the second effort by Brynjolfsson and McAfee in as many years and this book follows up with more detail last year’s effort: Race Against The Machine: How the Digital Revolution is Accelerating Innovation, Driving Productivity, and Irreversibly Transforming Employment and the Economy. While the first book hints at the benefits of the digital age, the new effort is a cautionary tale about the downside of automation as machines replace people at routine tasks (and some that are not routine). But really the two should be considered one big volume. The central metaphor is the chessboard and exponential growth, which the authors boil down to the notion that the future evolution of technology builds on past experience but with an exponential twist. For example, if you place a grain of rice on square one of a chessboard and double the prior amount on each subsequent square, very soon the pile is mind bogglingly large. By the time you reach the second half of the board there isn’t enough rice in the world to do the doubling. Such is the power of exponential growth that it is hard to imagine the downstream effects once doubling begins and that is the point of other exponential effects in our lives such as Moore’s Law. Let’s save the truth squad’s report for another time, you know, Moore’s Law is not a “law” like gravity or anything close or that each time Moore’s Law bumps up against the ceiling, someone comes along to rewrite it and provide more head space. True laws don’t require rescue. What started as a prediction about doubling the number of transistors on a silicon chip every 18 months has been transformed into a more general statement about the power of layering invention on top of invention, technology on technology in a very short time until you have something unrecognizable to the original generation of technologists. In the world of digital data and automation driven by Moore’s Law, the second half of the chess board becomes a wonderland full of amazing machines doing smart things — cars that drive themselves is a favorite example. But the second half is also full of pitfalls. Machines can drive themselves, prepare tax returns autonomously, fabricate products, win Jeopardy!, and many more miraculous tasks that make us obsolete. But machines are terrible (still) at doing the simple things any 2 year old does not to mention complex communication, social-motor-cognitive things and other jobs that might only require a high school diploma. Teach a computer to tie your shoes and you will really have something. The authors’ solution is not to fight the machines but to find ways to win with them. In a kind of 1 + 1 = 3 approach they make the interesting suggestion that a weak human with a good computer and a good process usually beats a really fast computer alone or even the computer plus a smart human. This might be the most important point in the book and it drives us right into the report and my point about marketing automation in general. The “2014 State of Marketing” document represents information gleaned from a survey of more than 2,500 marketers and covers future plans and approaches to marketing. What caught my eye is that in so many areas of marketing the demand for marketing technologies is saturating rather quickly. To a large extent companies have surrounded themselves with outbound social marketing tools and many are disillusioned for predictable reasons. A summary page shows data about current and future use of specific marketing automation technologies. Many of them already have high participation rates like 88% say they use Email Marketing, and 81% say they already use Data and Analytics while 78% use Social Media Marketing, 64% use Display/Banner Ads, and 75% use Landing Pages. Indeed, it seems like the majority of outbound marketing tools have high adoption rates overall. If I had to evaluate the state of marketing in line with this data and the MIT scholars, I’d have to say that we’re only at the 1 + 1 = 2 stage. We’ve got great machines and smart people using the combination of marketing hardware and software but I’d say that we still lack process. That’s because process is one of those things that comes along rather late in adopting new technologies. The most natural way we adopt technology is to attach it to old processes. So we see from the report that organizations are sending out well over a million of emails per year — about half send less and half send way more. This says that the processes used in marketing have not changed much from the days of sending offers through the mail. Back in the day you sent mail because it was a cheap way to see what would stick. Today sending out massive numbers of offers isn’t just cheap, it is virtually free but it makes you wonder about all the discussion of how new technologies would enable us to hit the bull’s eye rather than relying on making random and rather poorly defined offers. The processes now being used by many marketers are scarcely different from the old spray and pray approaches of broadcast media days. The whole point of adding a social element is to figure out which customers to invest marketing effort in but the cost of using social in broadcast mode is so low that few of us are bothering to think differently about our processes yet, or so it seems. 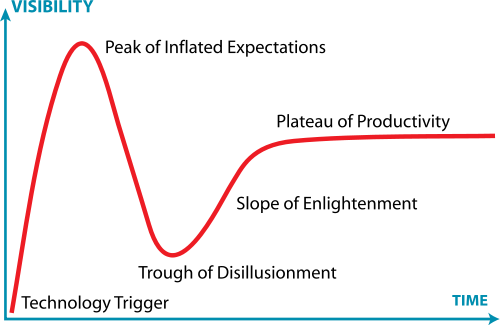 It all comes back to the hype cycle and the realization that there seems to always be a gap between introducing a new technology and having it achieve its greatest utility. The reason for the gap, which you can infer from Brynjolfsson and McAfee, is that it takes time for complementary technologies and processes to evolve once the primary innovation has occurred. In our experience those things come from ecosystems of other vendors who develop things and processes that optimally utilize the original innovation. If you look at the data from the report you can clearly see that marketers have adopted modern outbound technologies sure enough but old processes are being maintained while inbound strategies play catch up. A telltale sign from the report is that only 37% of the respondents use lead scoring and while 30% say they’ll try it this year, a full third say they don’t plan to use it. But lead scoring could easily be the poster child for process, for getting from old school broadcast marketing to the future. And who wouldn’t want that? Consider this. Your leads, even from a well-structured nurturing campaign, are a dog’s breakfast of potential deals that will never close and some that will if a sales rep picks up a phone. Wouldn’t you like to know which is which? Of course you would because leads are a perishable commodity just like the bananas in a grocery store. A lead doesn’t rot like a banana but it goes away because someone else is going to approach it first and that’s what lead scoring helps with. This is all in line with other bits of data that I have collected suggesting that even with the analytics capabilities marketers now possess we still don’t collect enough of the right stuff. Specifically, we let sales off the hook too often by not demanding feedback on the quality of marketing qualified leads. How do you improve without it? Also, we still don’t collect enough data about our marketing processes and this goes right to the heart of the 1 + 1 = 3 argument. By default we collect data about our programs such as costs and what’s harvested, i.e. leads, dollars, products. But what we fail to collect is data about our processes, specifically time. We often don’t timestamp marketing processes and without that simple extra data collection we give up knowing how long marketing opportunities stay in various states. Absent this basic data and the information derived from it we can’t easily know which programs work best and a whole array of other stuff. This is getting long so let me net this out. We’re mid-way through the social revolution according to the data. But according to the book we haven’t yet figured out how best to use the stuff that we have. That knowledge is on the second half of the chessboard and it is only when we get to that point that we’ll see the big marketing benefits we’ve always been promised. You can call it a hype cycle if you want but from now on I’m going to call it the creativity gap. Note: This blog was cross posted at the Lattice Engines blog. Erik Brynjolfsson and Andrew McAfee of the MIT Center for Digital Business and the Sloan School of Management have written an interesting book for our times — our economic times — with an appealing metaphor that any technologist will appreciate. Race Against The Machine: How the Digital Revolution is Accelerating Innovation, Driving Productivity, and Irreversibly Transforming Employment and the Economy, is short and to the point and it ought to be required reading. The subject matter is employment growth or its lack in this rather austere recovery and the effect on future employment and growth. More specifically, it is about the changing relationship between humans and their creation, the computer — the almost-thinking-machine — and how it can out-compete its masters not only in routine manufacturing tasks but, increasingly, in jobs that were once thought to be the exclusive province of human thinking. The metaphor, from futurist Ray Kurzweil, holds the narrative together and is worth pondering before we continue. It is told in the form of a story about the invention of chess. The emperor, the story goes, was so delighted with the game that he gave its inventor a wish. The sly inventor asked for a grain of rice to be placed on one square of the chessboard two on the second and double the prior square’s total on each succeeding square. It is the story of exponential growth. Accumulating the sums of rice on the first half of the chessboard was manageable but the second half totals were truly significant, from small beginnings arose a mountain of rice that would dwarf Mr. Everest. McAfee and Brynjolfsson apply Kurzweil’s story to another runaway exponential progression, Moore’s Law. You may not need to be reminded that Moore suggested that computing power would double and its cost halve every 12 months or so. With some fine-tuning the period was raised to 18 months and has continued for virtually the lives of all people in the technology industry today. But that’s not the crucial part of the story or the book. The authors calculate that we have only recently (in the last few years) crossed over from the first 32 squares of the chessboard into the second half where a metaphorical Everest awaits us. The gains in the second half of the chessboard will likely come from advanced software and algorithms and not hardware per se. They point out that while computing power has increased one thousand fold on the first half of the chessboard, the power and quality of our algorithms has increased 43,000 fold. The chessboard’s second half is already giving us systems that can diagnose better than doctors, out lawyer lawyers and, of course, kick booty in Jeopardy!. So what will happen next? McAfee and Brynjolfsson are quick to point out that the thinking that machines do is not the thinking of humans. It is often the lightening brute force effort of crunching a great deal of data to ferret out an answer. Also, training a machine to pick up a pencil from a random table top, let alone use it, is still elusive. The major point of The Race Against the Machine, is that there really is no race, or if you think there is be prepared to lose. But this book is fundamentally hopeful because it suggests that machines are tools that ought to off load people from their rote tasks to concentrate on the creative, entrepreneurial and innovative endeavors that only humans can engage in. What’s powerful about this argument is that it offers a prescription for a solution: Leverage the machine rather than fight it. Crunch big data in every way you can imagine, ask “What if” questions ad nauseam and above all, innovate. As I look at CRM and the broader technology world, it seems to me that the subdivided chessboard is visible everywhere. What we once called innovation was surely innovative but it was really no more than automation of what existed before. True innovation starts on square 33 when we realize that all the automation is mostly behind us and innovation means making totally new concepts. McAfee and Brynjolfsson speculate that we reached square 33 in the middle of the last decade. If true, one of the first true innovations we all witnessed was the social media revolution. Combined with the mobile revolution and today’s quest to master Big Data, we have a potent nucleus on which to invent new businesses, models, and processes. And if we combine what we know about the chessboard and where we are on it with what we know about our industry we can clearly see that some vendors are simply automating on the first half of the board while others are innovating on the second half. Let’s not fool ourselves though, simply innovating on the second half of the chessboard is no guarantee of success, just as always, bad ideas will still yield bad results. But it is also true that failing to try, to enter the second half is a sure route to oblivion. This is not simply a matter for the tech sector or even the nation. It’s a large scale economic issue that will affect our species. Historians and others often debate when specific eras start, because they don’t often follow calendars and precise dates. Some people say that the twentieth century started in 1890 with the closing of the American frontier, for instance. With this as a guide and McAfee and Brynjolfsson’s fine and short book as context, I’d say the twenty-first century started in about 2006.